Kurtcedes with Amber Riley and Chris Colfer! GLEEKS REJOICE!! Actors / singers / authors - AMBER RILEY and CHRIS COLFER reminisce with Kevin & Jenna about their first impressions of each other - traveling around the world together - and their WILD NIGHTS OUT during their time on GLEE!! Vampire Bites with Candice King & Kayla Ewell! CANDICE KING & KAYLA EWELL share how meeting on the set of THE VAMPIRE DIARIES led to the creation of their podcast - DIRECTIONALLY CHALLENGED - and why Diane Keaton is the patron saint of their friendship! ALSO - find out how often Kevin McHale splits his pants at weddings! Scandalous with Katie Lowes and Adam Shapiro! SCANDAL star KATIE LOWES and her actor / director hubby ADAM SHAPIRO chat with Kevin & Jenna about all of their work-life collaborations - including - catering, nannying, Disney voice acting, starting the IAMA Theater Company, performing WAITRESS together on Broadway and of course - PARENTING!! 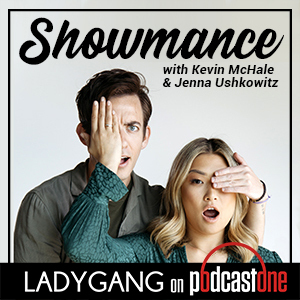 They talk about Katie's podcast - KATIE'S CRIB - how Sinead O'Connor played a role in their relationship - AND Kevin & Jenna share some singing / dancing BTS from their Glee days! !